Can’t wait to get my hands on the new issue of Bloom mag. 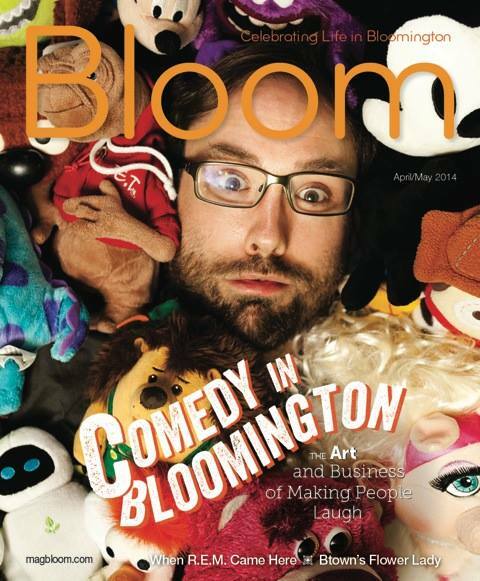 The Comedy Attic‘s Jared Thompson graces the cover. Inside, you’ll find out all about funny business in this town, natch, so grab one when you get a chance. You know, of course, that the Limestone Comedy Fest is fast approaching. This year the fest features as a headliner Patton Oswald. Sure, he’s good, but can he rival last year’s appearance by Tig Notaro for getting Bloomington’s laugh-addicted pumped to the sky? Time will tell. So I’ve been bragging and crowing about how fab these recent spring days have been. Y’know, sunshine, warmth, daffodils, forsythia, breezes, short pants, and the ebbing of crushing winter depression. All true. Life has taken a decidedly more positive turn of late. In fact, I threw every window in the house open yesterday. The months-old atmosphere redolent of garlic, olive oil, my socks, me, dog, cat, and other foulings of air were swept out forthwith and, within minutes, the joint smelled like a delightful cabin in the woods. It was so warm last night that most of the windows were still open when Steve the Dog, Sally the Dog, Kofi the Cat, and I all fell asleep on the two living room sofas. It was as peaceful a sleep as four creatures could experience together, all of us lulled by the rustling of budding trees and bushes in the soft wind and the occasional distant hoot of an owl. 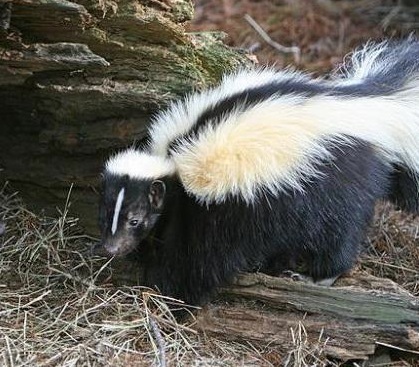 But then an unseen skunk shot a blast of self-defense at some threatening critter and the first wave of reek blasted the four of us out of the arms of Morpheus. Steve and Sally began barking and howling like mad dogs, my eyes began watering, and Kofi went so far as to stir, stretch, and resume his snooze. So, I’m still pretty deliriously happy about spring, only I’m now reminded nothing’s perfect. The WFHB Board of Directors will have a new look after the station’s annual meeting June 7. That’s when the general membership will vote to fill three open spots. Current Board members Carolyn VandeWiele and Matt Pierce (also state representative from the 61st District) are giving up their seats and Hondo Thompson quit the Board a while back, with his seat filled on an interim basis by Richard Fish. Fish is running for a full term this time. Here are thumbnail descriptions of the four candidates for the three open spots, as selected by the current Board’s nominating committee. Sarah Borden is new to the WFHB family but has been seeking the best way to volunteer her skills at the station for some time. She has a business background and offers skills in accounting, bookkeeping, tax filing, payroll, budget preparation and monitoring, financial planning, grant research, writing, submission, and management and specific HR duties which could be very useful to the station. Benjamin Loudermilk comes to us through the on-air appeal for persons interested in applying for the WFHB Board of Directors. He writes “I have been a proud supporter and listener of WFHB since it was launched on the airwaves 20 plus years ago. When I learned of the upcoming open seats, I was excited at the prospective opportunity to seek candidacy to serve on WFHB’s Board of Directors.” Benjamin is a native Bloomingtonian, currently employed as a Paraeducator at BHSNorth, and an IU alumnus. He has been active in the local Arts community for over 30 years. He feels his strongest skills are in communication, research and networking. William Morris has been associated with WFHB for nearly five years – as a DJ (“Brother William”) on several music shows, as a roving reporter and news reader with the Daily Local News, and as an interviewer/producer on Interchange. He states “Now, I’d like to participate in a broader, more-constructive and (hopefully) more productive way as a member of the Board of Directors…. As an attorney, I believe I can help the station think through and resolve legal matters that it will face in the next several years. As a former journalist and big-time music fan, I hope I can help the station look at programmatic, artistic and creative decisions. And, as a five-year member/volunteer of the station, I hope I can share my enthusiasm for WFHB with others in a way that fosters greater community, camaraderie and achievement. Other candidates can still get in on the fun through a petition process. One of those is Maryll Jones, who started the Friends of WFHB Facebook group. The Friends arose in reaction to the Board’s selection of Kevin Culbertson as general manager last fall. Culbertson’s nod sparked a firestorm of controversy when it was revealed he’d been instrumental in operating a number of Christian radio stations out west and that he wasn’t a member of the Bloomington community. Jones is collecting signatures at this time. Never in my 30 plus years of working in broadcasting and media have I seen such hostility in a work environment. The slanderous statements and cyber bullying have passed the point, in my opinion, which any reasonable person would believe there would be an expectation of being able to accomplish the objectives of the station in due course. WFHB honchos are hyper-sensitive to the possibility that Culbertson might file suit. Even a suit without much legal basis would have to be answered in court, meaning the station would incur potentially devastating expenses. It’s been decided that since Friends is an independent entity, the station shouldn’t have any connection with it as long as WFHB still has exposure to legal action. Ergo, Maryll Jones won’t be getting an official imprimatur from anybody connected with Firehouse Broadcasting any time soon.